Lee Kuan Yew, the founding Prime Minister of modern Singapore passed away in the early hours of the morning on 23rd March. He passed away five months before the 50th year of Singapore’s independence, an independence that was handed to him and the Old Guards of PAP (People’s Action Party). They went on to lead and develop the then fledgling nation-state of Singapore into one of the world’s financial centres and a leading metropolis within a generation. Marked by a strong-will pragmatism and a farsighted vision, Lee Kuan Yew was the first among equals of a very talented and capable team that guided and built the modern Singapore of today. A modern Singapore that is shaped according to his vision through his numerous and sometimes controversial policies and actions. A modern Singapore that has, over the years, become synonymous with the man himself. Lee Kuan Yew has become so ingrained in the national psyche that to mention his name is to mention Singapore and vice versa. As Tommy Koh, Singapore’s Ambassador-at-Large, succinctly stated: Lee Kuan Yew is Singapore’s George Washington. Yet even with his larger than life stature, Lee Kuan Yew eschewed any statue or national monument in his image. And there is no need. For the Singapore today is his national monument. After he stepped down as Prime Minister in 1990, he turned his focus to the wider geopolitical arena, and became the elder statesman whose political insights and comments were sought by others around the world. However, Singapore and its survival on the world stage, still remained his top priority. As the day comes to an end, obituaries and tributes flowed and continue to flow from various world leaders, international news agencies and online media, not to mention the various tributes and condolences from Singaporean politicians and populace. As a young Singaporean who did not live through his premiership but yet felt his strong presence during his years in Cabinet as Senior Minister and then Minister Mentor, I may not agree with many of his decisions and his actions but I respected him for dedicating his entire adult life to Singapore. Given his international reputation, Lee Kuan Yew will always remain a controversial figure. It is and it will always be difficult to divorce the man from the legacy, to separate the myth from the fact. But now is neither the time nor the day to debate his legacy. That time and day will come later. 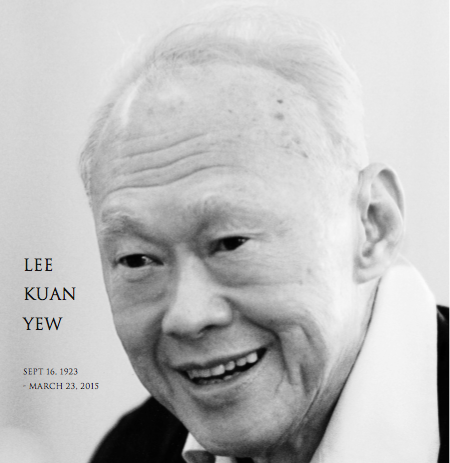 Now is the time for reflection and a moment of silence for the passing of one of Asian’s leaders and with him, an era. This entry was posted in Singapore and tagged Lee Kuan Yew, Prime Minister, Singapore by Zareth. Bookmark the permalink.